My dad finally figured that the pedals were not working because something had gotten stuck in the boat’s propeller that was located in the water. “I just need to be able to reach deeper into the water,” my dad grunted as he slid his entire upper body over the back edge of the boat. The boat suddenly tipped and wobbled and I lunged to catch Brianna as she lost her balance. But, just as I grabbed Brianna, there was a huge SPLASH!!! OUR DAD HAD FALLEN INTO THE LAKE!! “OH NO!! Daddy’s in the water! We need to save him!” Brianna screamed. So off he went! Even though it was a LONG way to swim…er, I mean, dog paddle. I peered toward the shore, where I could see my mom. But, her head was STILL buried in her book. The chance of her actually seeing any of us was very slim. I held onto Brianna’s arm while she cheered. The LAST thing we needed was another Maxwell toppling into the lake!! After a while, Brianna got tired of cheering and slumped down into her seat. I was afraid she was going to start complaining non-stop about being tired and bored. But, she suddenly squealed excitedly and jumped to her feet, wobbling the boat like crazy. “We need to be RESCUED! So, let’s send a message in a BOTTLE!” she shouted. Brianna had a candy wrapper and a crayon in her pocket, so she wrote SOS on the candy wrapper, shoved it in the bottle, and then HURLED it into the lake. Where it BONKED my dad on his HEAD!! “OWWW!” he yelped in pain and flailed around for a few seconds until he spotted his water bottle bobbing on the surface a few feet away. This whole time, my mom had STILL not looked up from her book ONCE!!! And, no matter how much we yelled and shouted, she could NOT hear us. Those noise-cancelling headphones can drown out Brianna when she’s sitting right next to her!! I could already see my dad wasn’t going to make it anywhere near the shore. Thankfully he made it to a buoy that marked the outer edges of where people were allowed to swim in Lake Foster. He grabbed onto the buoy and held on for dear life, gasping. I wanted to lie to her. But as clueless as she can be, when it’s important she can almost ALWAYS spot the lie. I expected her to fall apart. But I didn’t give that little pipsqueak enough credit!!! JUST GREAT☹! The last time Brianna had tried to help out, she’d almost given dad a concussion by klunking him on the head with a water bottle. We were lucky he was still out there clinging onto that buoy. Brianna looked around to see what supplies we had in the boat. She was probably imagining rigging up a sail like Moana did. But, that was SO not happening. The seats were made of plastic and there was nothing in the boat but us. “Daddy said something was stuck in the propeller thingy, right?” she asked. I didn’t even think she was listening, she was singing so loud at the time. “Well, WHERE’S the propeller-thingy? !” she asked. Soon I was dangling off the back end of the boat while Brianna held onto my feet. I waved my hands around wildly, hoping to hit the propeller thingy!!! I was about to give up when I felt it!! And right away I felt a crunched up plastic water bottle in the propeller. “I found it!” I yelled. “YAY!” Brianna shouted and clapped her hands happily. Which also meant that she let go of my FEET! My entire body went toppling into the water!!! “NIKKI! Are you okay? !” my dad yelled from his buoy. 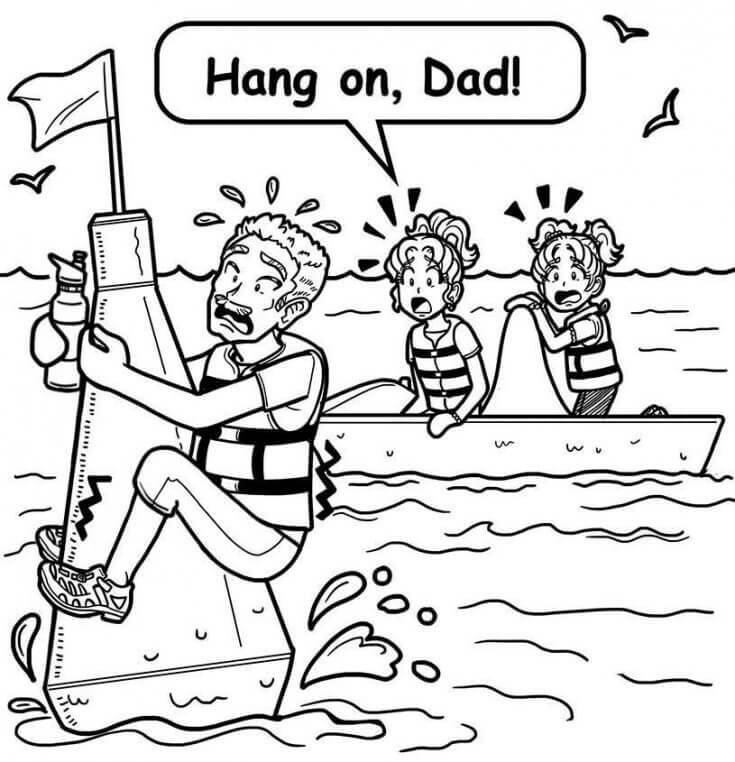 “I’m good!” I sputtered as I held on to the back of the boat. “SORRY! !” Brianna giggled and then shrugged like it wasn’t her fault. Being in the water actually helped me pry the plastic water bottle out of the propeller thingy. Then I scrambled back into the boat. Brianna and I gave each other a high-five because her brilliant idea worked. THEN we worked together to pedal the boat over to the buoy to rescue dad. With Dad back in the boat, we headed toward the shore. As we stumbled out the boat, my mom looked up and removed her earphones. Dad and I were both drenched from falling in the lake and Brianna was holding up the crunched plastic water bottle in super heroic triumph. “Mommy! Guess what? We rescued Daddy!” she shouted. And then she went back to READING!!!!! Anyway, I was very proud of how we’d all worked together to fix the boat and get back to the shore. But, I am NEVER getting on another pedal boat AGAIN!!!! Have you ever tried to do something that turned into a complete and utter DISASTER?! I’d LOVE to hear all about your experiences, especially the FUNNY, WACKY ones!